For more information, visit our Christmas Lighting Installation Service website. 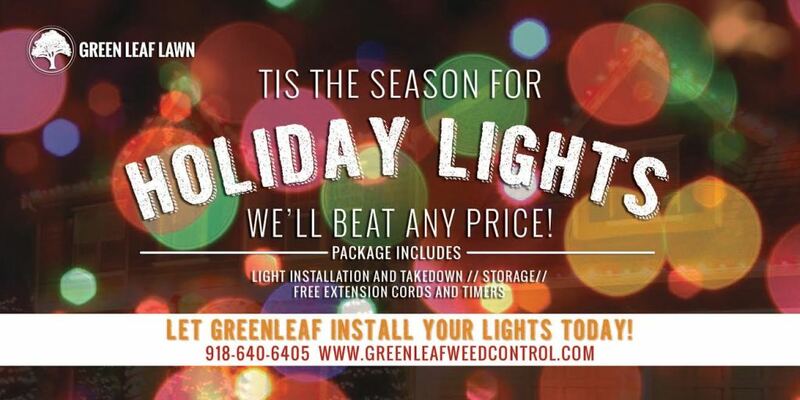 Greenleaf Lawn is here to help homeowners, business owners and property managers with all there holiday lighting installation needs! Are you looking for licensed, insured & bonded professionals to decorate your home or business for the holidays? Look no further then GreenLeaf, Tulsa’s only BBB (A+) Rated Christmas light installation company. Don’t let the holidays stress you out this year! Allow Greenleaf to take over putting up the lights for you. We can create the perfect holiday atmosphere for your home or office. The best part is that you don’t have to lift a finger or a ladder. Greenleaf comes, installs and tests the lights to make sure they are working properly and energy efficiently. We leave before you know it, allowing you to enjoy the rest of your day. After the holidays are over and you’re ready to have the lights taken down, we will come back out to your property uninstall & store them properly as part of our full-service approach. We are ready to help make your property stand out and look fantastic this holiday season without all the hard work & headache. Best Prices in Tulsa Guaranteed! Or for Online Quotes, Simply Click the Free Estimate Button to the right.